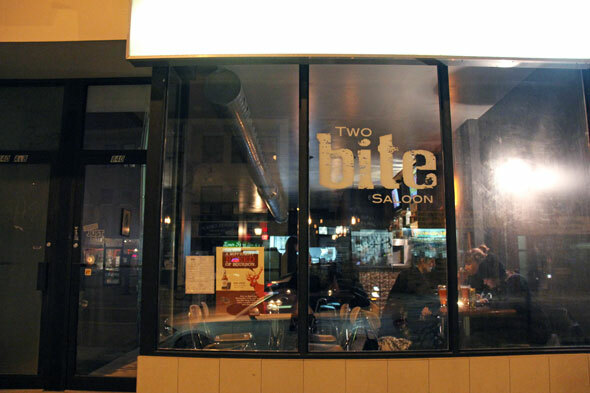 Two Bite Saloon opened up less than week ago, and is perhaps the most convincing argument for the recently much-touted growth of the Bloor and Ossington area. 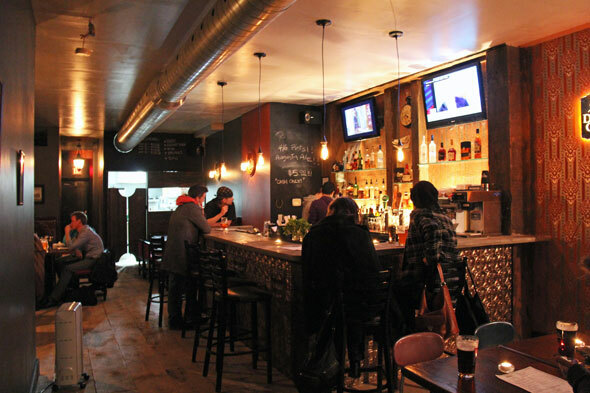 Directly beside Tallboys , it too offers craft beer on tap and in bottles, although owner (along with partners Charlie An and John Kim) and bartender Daniel Fortin (formerly of Mildred's and Circa , among others) tells me that there's only camaraderie between them. Inside, it's eclectic. The former Ethiopian restaurant has been refurbished with occasional baroque wallpaper and dark wood, wall sconces and hanging bulbs, and polished wood flooring. 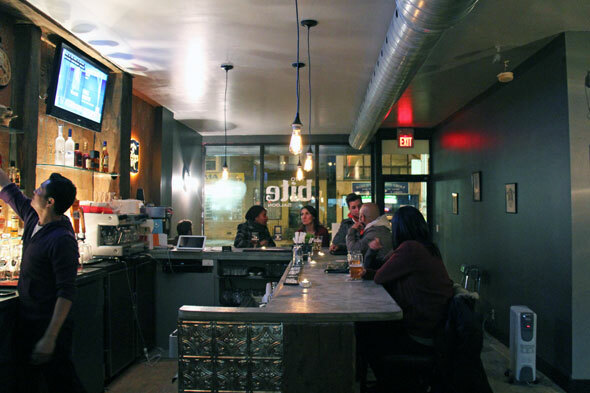 The wraparound bar is ornately paneled, but the service is casual, the locals and (already becoming) regulars make friends at the bar, and it feels comfortable. We start off with pints of Lake of Bays ($7), although beers such as Amsterdam 416 are also on tap, with bottles such as McAuslan Apricot available for $6, and tall cans of Kensington Augusta Ale for $7. 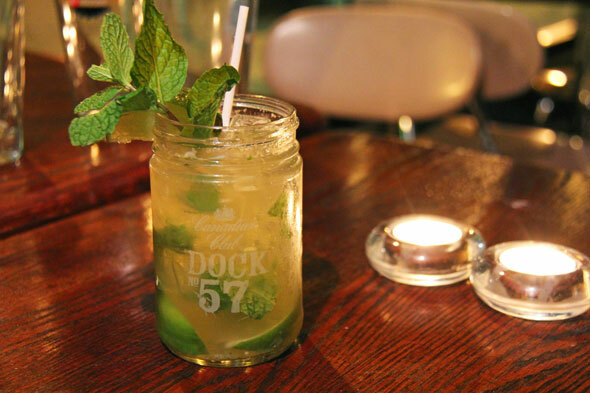 The cocktail program comes courtesy of Fortin, and features both straight-up classics such as the old fashioned ($9), and creative departures such as the mojito-meets-sidecar-by-way-of-bourbon Wishing Well ($9). The latter is refreshing, although undeniably more suitable for summer. The menu has definite Southern leanings and chef Nathan Jones' ( The Saint , Ultra Supper Club ) passion for Southern food, and his patience and ability with a smoker, shine through in each dish. As for the sliders? Fortin tells me that he wanted to create a menu where people could "sample a little bit of everything." 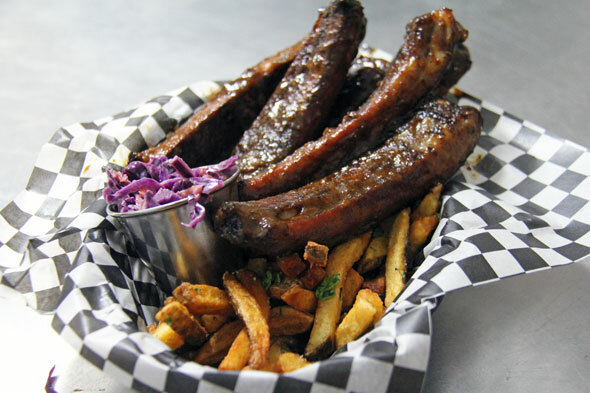 The ribs ($17, with side of fries and kale salad) truly rank among the best-tasting I've encountered in the city. They're moist and tender, yes, but exceedingly so, thanks to Jones' commitment to slow-smoking, then chicken frying, which batters them somewhat to ensure that the juices remain intact, but doesn't come across as chalky or fried. The Carolina-style BBQ sauce is the perfect marriage of sweet and savory, and comes generously slathered on the 5-rib portion. The kale salad ($5) threw me a curveball. Even the most set-on-murdering-you-at-the-table-with-grease Southern meals employ some type of collard green, but this was more of a stew. 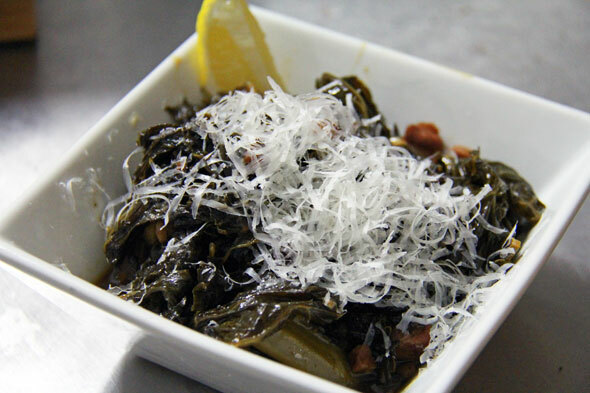 The kale is front and center (having been simmered in brown sugar for a bit of glaze), but the smoked ham-hock is unavoidable and rich, and the shavings of parmesan add a sharp, salty flavour. The portion isn't excessive, but don't be fooled: this is no dainty green salad. Next up is the generous portion of poutine ($6, or $5 as a side). Some restaurants will drown mediocre fries in decent gravy and call it a day, while others (I'm looking at you, Murray's ) serve perfect poutine even when they're running low on gravy (mysteries without answers). 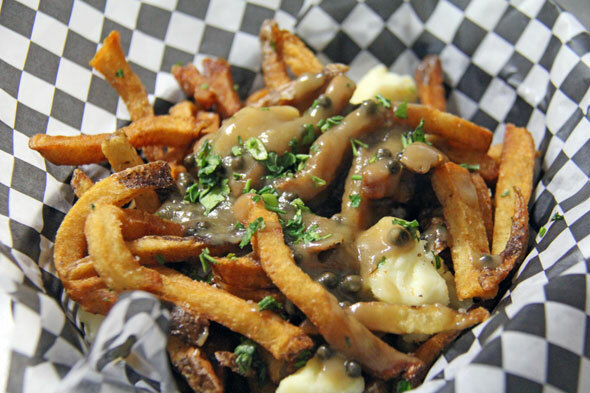 The fries begin as organic russet potatoes, tossed in herbs and house-smoked salt (details, people), and are then topped with green peppercorn gravy and cheese curds. The dish as a whole has an earthy, mushroom-y quality, without losing the underlying kick and crispiness of the fries themselves. 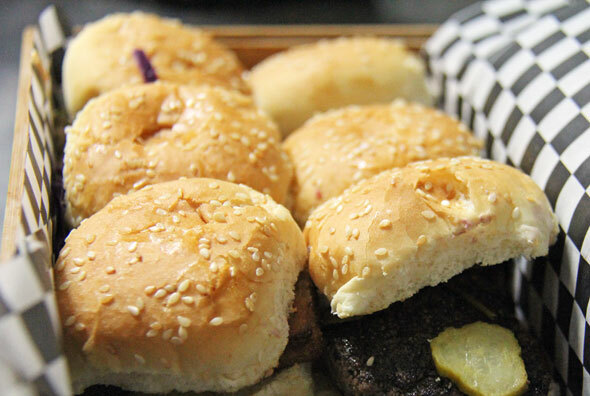 Two Bite Saloon bills itself as a slider house (following closely on the heels of newly-opened Slider Revolution ), and it's what best sets it apart (on paper) from your run o' the mill pub. There are 5 options available (1.5-2 oz. each), and you can get any combination you want at $10 for 3, $14 for 5, $18 for 7, and $24 for 10. 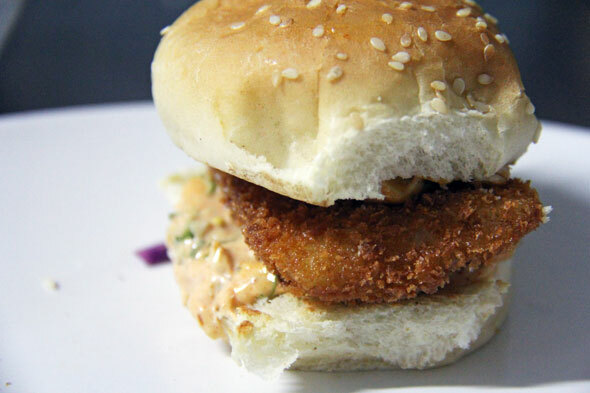 We're told the hands-down best-seller is the wild catfish (panko-battered and topped with chef-made tartar sauce), followed by the pulled pork (local and GMO-free pork smoked with apple and hickory, and crowned with buttermilk slaw). We try all of them, and the catfish is, indeed the best. 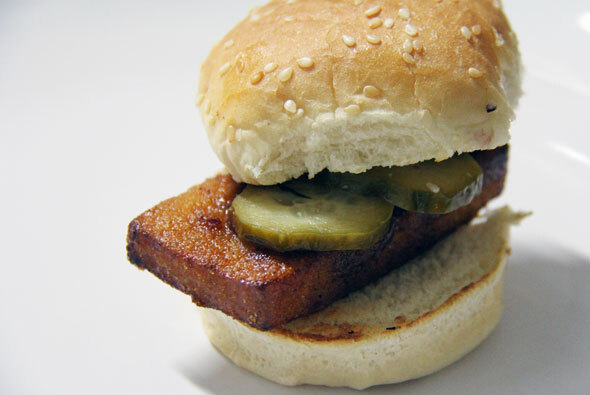 A surprising runner-up is the organic tofu slider. Representing true commitment to even the (let's face it) likeliest-to-fail-in-a-pub-environment item on the menu, it's marinated in chipotle and maple, then maple-wood smoked, then battered in cornmeal and fried. Delicious, and a coup for vegetarianism. Other than the pulled pork, which bore the same sauce as the ribs, the other two meat sliders (beef chuck and slow-braised brisket), were entirely eclipsed. I was immediately tempted by the muffins ($4 per order of 2), having discovered my love for humble cornbread while in Louisiana. 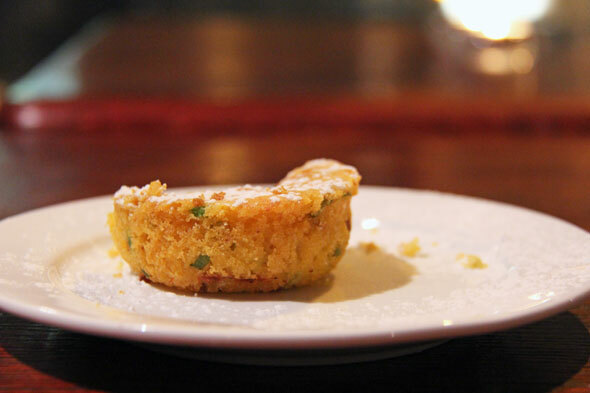 By the end of the (truly gargantuan) meal, we're full, but they arrive--deceptively small and dusted in powdered sugar--under the guise of dessert. The sweetness of the yellow corn is offset by charred poblano chili, but the texture is perfect, and Jones sells me on a freshly-made batch of BBQ sauce for a dip. Decadent, but I prefer them naked (yes, they are pictured above, and yes, they're turned away from the camera to hide a heat-of-the-moment love-bite). There's real passion behind the food, and it's a meal we were still talking about the next day--and that's sayin' something.